Professor Ven. 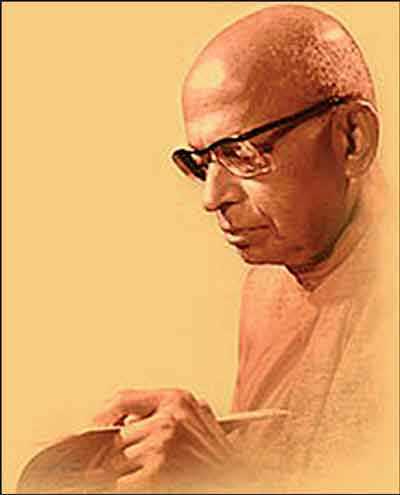 Walpola Rahula (1907-1997), a Buddhist rationalist and free-thinker of international repute, was a unique intellectual, teacher and writer who never minced his words when speaking truth to power, a rare quality fast disappearing in a world of comprador intellectualism. “It would be a crucial weakness,” he avers, “if you do not express your honest and forthright views fearing public opposition. Persons seeking personal gain, glory, praise, and power are reluctant to go against public sentiment by expressing their honest opinions.” These words of his must be engraved in gold on the doors of every educational institution in the country. This need for self-introspection is conspicuously absent in all three communities, which are ready to blame the other for their own short-comings. Rev. Walpola Rahula’s address to the Buddhists is applicable to other communities as well. At a time when Buddhism and other religions of the country have become so politicised and used instrumentally to achieve power, prestige and opulence, the noble teachings of the masters are lost in the wilderness and ignored by both preachers and practitioners. It is in such gloomy environment that Sathyodaya radiates its light to drive away the spiritual and moral darkness that is fast besetting the nation. Ven. Rahula’s singularly forceful and impeccably erudite critique of the ruling Buddhist orthodoxy and its ritual-centric misrepresentation of the Buddha’s teachings has relevance even to non-Buddhists. When he says that, “After the founder of a spiritual teaching passes away, the priests associated with the teaching frequently alter the religion into a livelihood,” he captures the mind of millions of young men and women who are fast losing faith in any religion. The gatekeepers of these faiths deliberately keep the masses ignorant of the true message of the masters and make a living out of that ignorance. Through a language not understood by the vast majority of followers, and through a priestly class distinctly separated from the masses by way of attire, appearance and artificial veneration, religion has become a source of livelihood, control and even oppression. With reference to Buddhism, Ven. Rahula is particularly harsh on the community of Bhikkhus. He points out that, “People have moved away from the right teaching due to mistaken notions such as ‘the Bhikkhus are the Sangha’, ‘the legacy of the Buddha cannot be maintained without the Bhikkhus’ and ‘the legacy of the Buddha will end when there are no robe-wearers’” He questions the audacity of the Bhikkhus in claiming that, “We are the Sangha. Without us how could the legacy of the Buddha survive?” In his elaboration of the ‘Disciple Sangha’ (Sravaka Sangha) and ‘Eight noble persons Sangha’ (Ashta Ariya Pudgala Sangha) he defines a community that may even include the laity. This and his attack on caste-ridden monasteries will shatter the monopoly that orthodoxy has historically bestowed upon the Bhikkhu community. On rituals and material offerings to the Buddha in the name of worship, Professor Rahula’s ideas are exceptionally rational, if not revolutionary. He knew that he was stepping into a very sensitive territory of Buddhist practices. Before he spells out his views on this matter, he warns the reader, “not to be upset or angry. When an unfamiliar opinion is being expressed on an issue, please listen with patience and compassion”, a quality many of us lack. We always shoot the messenger before reading the message. His explanation is typical of his intellectual maturity and compassionate outlook. “The Buddha, who was the epitome of ethical conduct (Seela), mental discipline (Samadhi), and wisdom (Pragna), departed over two thousand five hundred years ago. If we think that we can venerate him now by offering food items, it reflects our low moral maturity. We cannot pay our respects to him by offering material objects for consumption. The Buddha has stressed that he should be honoured through practice-based offerings (Prathipaththi Puja) rather than through flowers, food, money and other material things.” This reminds me of a Sri Lankan Hindu scholar and savant Swami Vipulanandhar (1892-1947), who like Ven. Rahula, was also critical of ritualistic Hinduism and material offerings by its worshippers. Prof. Rahula’s thoughts on Buddha Sasana deserves serious attention today by those who claim to protect it with political power. The Sasana, according to Sathyodaya, “signifies performing wholesome actions and refraining from unwholesome deeds”, he says. It is about cleansing the mind. It is represented by ethical conduct …mental discipline… and wisdom… Virtuous practice is ‘Buddha Sasana’.” If this is what Sasana means, do we really need a minister and ministry to protect it? The esteemed professor’s broad survey of the status of Buddhist community in the land of Dharmadeepa is true of all other communities. “Every week there are thousands of sermons delivered and numerous ‘meritorious activities’ organised across the country. Almost every village has a temple. There are over thirty thousand ordained monks to provide counsel. Yet, there appears to be very little advancement in moral conduct. Have you wondered why?” What he asked of Buddhists should equally be asked of other communities also. From a historical perspective, the Buddhist concept of free-thinking was an important factor in the rise of a rationalist movement in Islam headed by a group of philosophers called Mu’tazilites in the Abbasid Caliphate (750-1258). Thanks to Sathyodaya, let me illuminate this forgotten chapter of Buddhist-Islamic relations to help ease the prevailing disquiet between Buddhist and Islamic orthodoxies in Sri Lanka. Not many Buddhists and Muslims of this country would be aware of an ancient but famous Buddhist family called Barmakids from Balkh in today’s Afghanistan. The members of this family were the custodians of the Nava Vihara (Nawbahar) monastery. Sometime during the Umayyad invasion of Afghanistan in the 7th century, its members converted to Islam. During the legendary rule of Harun al-Rashid, the Barmakids rose to great power and influence in the caliph’s court before they fell out of his favour and were killed. What is important for the present purpose is that it was the intellectual influence of this Buddhist family, who were patrons of literature, philosophy and science and tolerant towards other religions, that fed the philosophical and intellectual appetite of free-thinking Mu’tazilites, who revolted against the prevailing orthodoxy and searched for the ultimate truth outside the scriptures. Although the orthodoxy returned with a vengeance after the 12th century and lately has embraced the ultra-conservative, exclusionist and literalist Wahhabi-Salafist ideology, early Buddhist influence on Muslim philosophers’ free-thinking must be acknowledged. Sathyodaya’s condemnation of blind faith in rituals and traditions is equally applicable to Muslim orthodoxy’s taqlid or blind imitation. 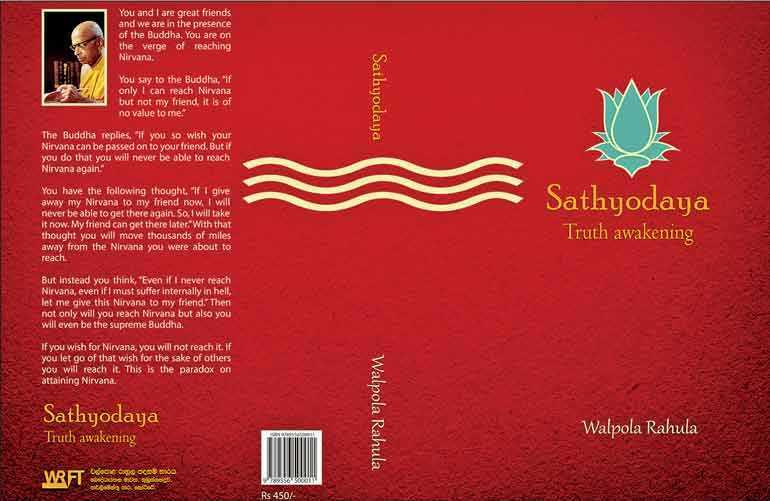 Another novelty in Sathyodaya is the author’s interpretation of the concept of Nirvana in Buddhism. “Nirvana is the final-state for all beings”, he says, “not only for Buddhists. If a person follows the teaching without desiring Nirvana but with intention of doing good to the world, he will reach Nirvana at the end of his journey.” Consider this with verse 62 in chapter 2 in the Holy Quran, “Any who believe in Allah and the Last Day and work righteousness shall have their reward.” Doing good is righteousness and it is open to anyone whether one is Buddhist, Muslim, Hindu or Christian. The reward for righteousness is Nirvana or paradise. This is the essence of Sathyodaya. In Rahula’s view therefore, Nirvana unites humanity. Buddhism and Islam are not religions in the Western sense. Buddhism is dhamma, the path of truth and righteousness, and Islam is din, the righteous way of life. In their obligatory prayers Muslims ask Allah at least seventeen times a day to “show them the straight path”. To Buddhists, “dhamman saranan gachchami” is to surrender to the righteous path, which is the “straight path” the Muslims ask for. What a congruence? Why should Islam be in conflict and why should Buddhists quarrel with Muslims in Sri Lanka? Ignorance is the reason and Sathyodaya is their salvation. When Professor Walpola Rahula critiqued Buddhist orthodoxy, his academic stature and intellectual depth was so unimpeachable no one dared to counter his arguments. His critique is highly relevant today, and unless Buddhists and others “cultivate pure and wholesome intentions for the deeds … (they) perform” and follow the true teachings of their masters, sages and scriptures, Sri Lanka’s pluralism will be thrown into jeopardy. Finally, when reading the Truth Awakening one forgets that it is a translation and not the original. Niranjan Selvadurai deserves to be congratulated for a job well done.